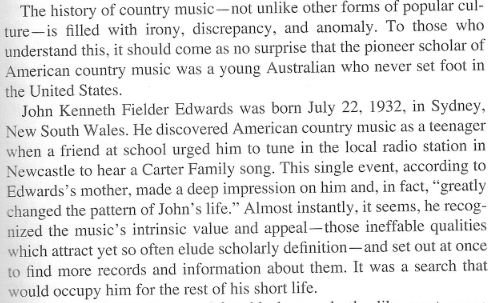 See previous post about John Edwards. Early one morning in late April, a truck from California rolled into Chapel Hill, bringing the John Edwards Memorial Collection–nearly a thousand boxes of old 78-rpm phonograph records, sheet music and faded letters–to its new and permanent home at the University of North Carolina. For this archive, assembled by a young Australian, shipped at his death in 1960 to a fellow collector in New Jersey, then back across America to a long residency at the University of California at Los Angeles, it was journey’s end.